This article is about the Ninjago character. For the character in LEGO Racers 2, see Jay (LEGO Racers 2). Jay Walker, born Jay Gordon, is the ninja of lightning minifigure and character released in 2011 with the Ninjago theme. He was the first of the ninjas to learn Spinjitzu, and he has a crush on Kai's sister, Nya. Jay appears in twenty-six variations; as a trainee ninja, a DX (Dragon Xtreme) Ninja, a ZX (Zen Xtreme) Ninja, a Kendo Ninja, an NRG (Energy) Ninja, Elemental robe, Techno robe, Techno Armour, Jungle, Tournament robe, Deepstone, Master robe, Airjitzu, Skybound, Honour robe, Swamp, Ninja Secret Force (TLNM), High School (TLNM), Kimono (TLNM), Sons of Garmadon, Kendo Gi, Spinjitzu Master, Hunted robe, Dragon Master, Legacy and a Microfigure. 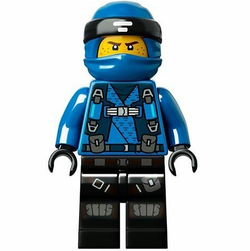 As a normal ninja, Jay has the classic ninja wrap first used in the Ninja theme from 1998, but in blue for the first time. Jay's face print (which would normally be covered by the ninja wrap with the exception of his eyes) is made up of two black eyes with white pupils, a small, yet determined, frown with a line below showing a chin, and two eyebrows, one of which is cut through. His torso, is a blue ninja robe with black hands and no back-printing. The printing that is on the front, reveals darker blue (Earth Blue) clothing under his robes. Also on the torso, is a little golden emblem, which is most likely a symbol of lightning in Ninjago, that also appears on Jay's spinner. Jay's legs in this variation are blue with a darker blue knot pattern printed on the hips and legs. As a DX ninja, Jay uses the same face and headgear as his first variation, but utilizes a special torso and legs combination. Jay's DX torso features printing on both the front and back; on the front, a golden depiction of the Lightning Dragon. On the back, the name Jay is printed on in gold. On the legs, a different knot tied to his right. Also on the legs, is a continuation of the lightning dragon design, where the tail is printed. Jay as a Microfigure is basically a Jay as a normal ninja in a smaller scale. 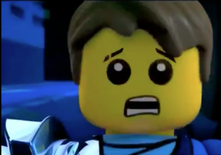 In Ninjago: Masters of Spinjitzu, Jay appeared as both a normal ninja and a DX ninja, however his facial expressions were changed to make him seem more friendly. He was also given the same hair as Mutt Williams (from the Indiana Jones theme) when he removed his wrap. In the 2012 sets, he appears as a ZX ninja, a NRG ninja, and as a Kendo ninja. The Kendo variant has a face guard over his face and black armor fitted over his normal ninja clothes. As a ZX ninja, he can be seen with a new head-cloth with a metal point at the tip. Also, he had a re-designed torso, with a tucked cloth and a dagger sheath. In 2013, his Elemental Robe variant was released. It is designed as a black robe with many blue colourings, and a blue headpiece. A silver crown is on it once again. His Ninja symbol is on his back surrounded by silver highlights. In 2014, he appears with Techno Robes. He has a half mask that covers his mouth, so his hair is exposed. His torso print is a similar print to Cole's. His robe is blue with sliver highlights. Some lightning detailing is also present. 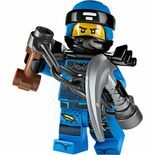 In the set 70728 Battle for Ninjago City he also has silver ZX shoulder pads. In Ninjago: Masters of Spinjitzu, Jay was shown to be discovered by Sensei Wu while testing a glider he had recently invented. He was then brought to Wu's monastery to train in the ways of Spinjitzu. He trained alongside fellow students Zane and Cole. The three later attacked another that they found in the monastary. After a fight started between the four, Wu appeared to break it up and introduced the newcomer as his fourth student, Kai. Wu then announced to the four ninjas that the search for the Four Golden Weapons was about to begin. At the Caves of Despair, location of the Scythe of Quakes, after the scythe was recovered by the ninjas, they are attacked by an army of Skullkins led by Samukai, the king of the underworld. Jay notices the enemies to be just like the training course, and after going through the motions Wu taught him, he summoned a tornado of lightning corresponding with his element. In other words: he performed spinjitzu, followed by the others. Samukai and his legion retreat, as a dragon protecting the Scythe appeared behind the ninja. In desperation, Kai uses the scythe, despite Wu's instruction not to use the weapon's power, as no mortal could handle it. A rift appears in the cave ceiling, and the ninja manage to escape. As the ninja are heading to the shurikens of ice, Wu teaches them the most powerful move in spinjitzu: the Tornado of Creation. The boat arrives, crashing into the island, and the ninja enter the frozen plains. Jay and the rest of the ninjas recovered the Shurikens of Ice. Next, At the Floating Ruins, they climb a giant nunchuck to the nunchucks of lightning, jumping down to escape the lightning dragon. The four use special inventions made by Jay, who made backpacks that spawn wings. The ninja are at such a high altitude that they are able to fly to all the way to the Forest of Tranquility, the location of the Sword of Fire. The group then go to sleep in the forest. Kai leaves while the others are asleep as he is under the impression that his sister, Nya is in the forest. Wu later leaves to follow Kai, while Jay, Zane, and Cole are still in slumber. Samukai and the army of Skullkins then arrive, steal three of the golden weapons, and tie the remaining members of the group to a tree. Jay grabs General Nuckal's sword and cuts the rope while the skullkins are not looking. The three ninjas then try to chase the Skullkins in their vehicles, but they escape to the Underworld. The ninjas then go to the Fire Temple where Zane senses the location of the Sword of Fire. Kai and Nya then appear with the fire dragon. Jay then learned of the sacrifice that Wu made. The ninjas then retrieve their elemental dragons and travel to the underworld. While in the underworld, Jay battled the skullkins (once again) and giant spiders. He then witnessed Samukai defeat Sensei Wu and take the sword of fire from him. Samukai was then seemingly destroyed, but the combined power of the weapons allowed Lord Garmadon, Wu's evil brother, to escape from the underworld. Jay then travelled to Kai and Nya's village where he and the other ninjas were welcomed as heroes. Jay had a small moment with Nya, she tells him blue is her favorite color, and Jay replies YES! she also tells Kai and Jay she's happy they are back. Then they hit their golden weapons together creating an explosion. 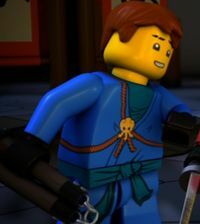 Jay also appeared in most of the Ninjago Mini-Movies. In the first, he gave Nya a ride to the Blacksmith to pick up a few things, as she is moving in with Kai and the Ninja at the Monastery. He also took part in the dragon race between the other three in the second. He was briefly heard and seen in the third when Kruncha and Knuckal tried to steal the Golden Weapons, and was also seen flying on his dragon in the 6th. In the Spinjitzu Smash online game, Jay appeared in three of the four campaigns. In his respective campaign, he and Nya built a balloon and journeyed to the Sky Temple to retrieve the Nunchucks of Lightning. In Zane's campaign, Jay accompanied the ninja of ice on his quest to retrieve the Shurikens of Ice. In Cole's campaign, Jay appeared as an illusion that led Cole to the cave where Carridi's daughter and the Scythe of Quakes were being held by Skullkins. Jay was only playable in his respective campaign. Also, in the game Smash Creations, Jay says that Nya is a great kisser when Sensei Wu tells Kai that she is not just an ordinary village girl, thus it can be assumed Jay has kissed Nya before, though he could just be joking with Kai. When Kai leads the charge before the last battle, Jay says he fights for love, further implying his feelings for Nya. In the new Ninjago mini-movie, Rise of the Snakes, his opptomism reaches its' peak with the battle of the Serpentine. After the ninjas go to Jamanakai village to investigate the report of Lord Garmadon's return, the ninjas find Lloyd Garmadon terrorizing the villagers. After leaving him to the villagers, they find the scroll about the Green Ninja, he is the most intruged. During the contest to decifer who it was, he lost first to Kai. After returning to Jamonicia village to investigate the Serpentine's return, he is relieved to see Nya has returned safely. Jay makes little apperance in this battle, only to say they are out of shape during the battle. In the second premire, Home, he is annoyed by Zane when he laughs at a movie when he and Nya are crying. 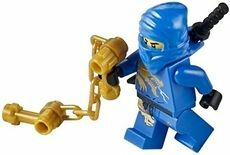 He and the other ninjas train to unlock the golden weapons when Zane tells them to follow him. After arriving at Lloyd Garmadon's treehouse, he finds it very cool and interesting. Nevertheless, he follows the ninjas to destroy it. When Cole in hypnotized, he tries to shock him with lightning, to no avail. When Sensei Wu un-trances him, he is devestated that the Serpentine destroyed all their video games. After they discover Destiny's Bounty, he is the first to comment on the food. In the eighth episode "Once Bitten, Twice Shy", he takes Nya out on a date for the first time. But it doesn't go at all as planned. He begins to turn into a snake and is too shy to tell Nya. Then Nya is chained up by Pythor on a roller coaster leading to a circle of fire. He reaches his true potential when Nya kisses him (Which makes his heart rate go up rapidly, repelling the Fangpyre Venom) and he discovers that he just needs to be who he is. 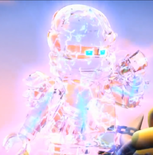 In "Rise of the Spinjitzu Master", he and Cole are hit by Dark Matter towards the end of the episode while protecting Lloyd, making them very briefly evil beings like Nya. At the end of the episode, Cole, Nya, and him are changed back. "I'm Jay, Ninjago's most loveable Ninja!" With Zane gone, the team became fractured and eventually Jay quit being a ninja in favor of hosting "Most Ultimate Extreme Ninja Challenge Ever." Shortly after, he was visited by Lloyd who attempted to get the Master of Lighting to return, and though Jay at first refused, he eventually met up with Lloyd, Cole, and Kai at Mr. Chen's Noodle House. Shortly after Jay objected to Lloyd's idea of adding a new ninja to replace Zane, Eyezor stormed in seeking trouble. The ninja soon found themselves united against the thugs as they battled them using food, until they retreated into an alleyway. The Ninja pursued, but all they found was a poster declaring Zane to be alive and an invitation to Master Chen's tournament of elements. Jay is lightning fast. He glides through the air, then strikes from above. Sometime with a mighty ninja flash-attack, sometime with a laughing thunder-joke. He's a very flashy fighter. Jay's super smart, super fast, and super resourceful. He solves problems with his brain and crazy inventions…so, prepare to be shocked. Jay speaks his mind, most of the time without thinking first, he is lighting fast, even for a ninja, and his quick wit, happy outlook on life, and eh... creative solutions always help save the team from danger. Obsessed with high-scores. Jay was the first of the ninja to master the power of Spinitzu. Okay, so it was only seconds before the rest, but still! He can be a little bit of a loudmouth about his own skills at times, and even though the team clearly enjoyed the silence when he lost his voice, he knows they think he's great! Now he just needs to convince Nya what a amazing ninja he is. Jay was the first of the ninja to do spinjitzu. Jay was the second ninja to unlock his true potential. As of Episode 8, "Once Bitten, Twice Shy", Jay went on a date with Nya, Kai's sister. In "Double Trouble" he is the only ninja to not need the help of Darkley's bad boys to defeat his "Bizzaro" self. In LEGO Battles: Ninjago , he has orange-ish hair instead of normal brown. Baxter Stockman from the Teenage Mutant Ninja Turtles theme re-uses his armour piece from 2012. Jay is the only ninja (except Lloyd and Nya) to not have a DX spinner card. Jay has a Cyrus Borg poster on the wall of his room. The notch in his eyebrow was caused by an explosion. Or should I say, I'd be shocked if we lose!